The wet weather is playing havoc with the racing programme in the UK and all three national hunt meetings must face a Saturday morning inspection to decide whether racing can go ahead. The All-Weather courses at Lingfield and Wolverhampton do go ahead and the pick of the action could be the one-mile Ladbrokes Handicap at Lingfield at 2.55. Trainer George Margarson supplies the favourite with recent course and distance winner Rebellious Guest. The five-year-old has been put up 6lbs by the handicapper to a new official rating of 86. The former Godolphin-owned son of Cockney Rebel has been slightly disappointing but bounced back to form last weekend. He was settled towards the rear by jockey Jamie Spencer before cutting through the field to beat Emkanaat by two and a quarter lengths. Spencer was able to ease down close home and he should be difficult to beat here off bottom weight. He was twice successful as a juvenile and was rated 99 in 2012 but struggled in the top handicaps on turf. Tom Queally takes over from Spencer for the ride on Saturday. Margarson is very adept at getting the best out of older horses and Rebellious Guest looks a good bet at 7-2 with Bet365. 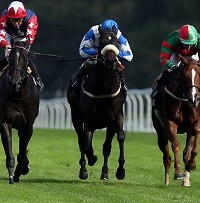 Apostle won last time out at Wolverhampton for David Simcock but was all out to hold on by a nose in a driving finish. All of his victories have come over six or seven furlongs so this mile could be stretching his stamina. Shamdarley has no such stamina concerns having won over ten furlongs on turf. This will be his first outing since August but Marco Botti usually has them fit enough to do themselves justice. He won on the all-weather surface at Kempton in July over this trip when beating Silverheels by a length and a half. Botti also runs Odyysee who is the dark horse of the race. She finished second at Chantilly in November and is very difficult to assess on that form. A filly by Teofilo, she could still be improving and is worth keeping an eye on in the betting market. Royal Prize is also a winner at Kempton and represents Ralph Beckett. The chestnut son of Nayef could be a threat if able to reproduce the form of his close second to Top Notch Tonto at Newmarket in July. The winner went on to finish second on Champions Day at Ascot, although he had clearly improved by then. The veteran Mia’s Boy is a regular visitor to Lingfield but appears to be in the grip of the handicapper. Now aged ten, he has gradually slipped down to a fair mark but could do no better than sixth behind Birdman here two weeks ago. True To Form finished narrowly ahead of him in fourth place that day but is by no means certain to confirm the form. Moonday Sun and Emerald Wilderness look to have too much weight while Verse Of Love and Snow King need to improve to feature here.